Unseasonal cold and continuous rain has meant hardly any time spent in the garden this month. It’s depressing for someone who needs the sun to shine on her shoulders every day. Looking on the bright side, there’s more time to be creative indoors and there’s always things to do in the kitchen. First on the list to do yesterday was my weekly batch of home-made yoghurt (which took a full 8 hours to set without some sun to speed up the process). 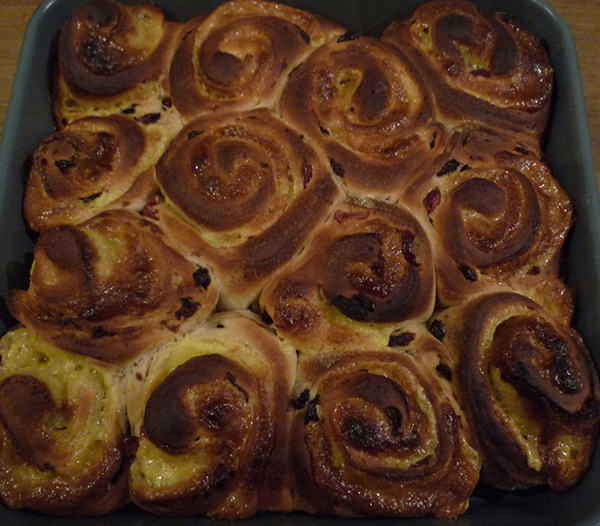 Then I started preparations for some fruit buns for the freezer. They’re easy to take out individually and microwave for 30 seconds to believe they had just come fresh out the oven. I’ve been making variations on a brioche recipe and some very successful Hot Cross Buns I made at Easter which turned out to be really soft and tasty. Since I got my KMixx mixer, I’ve been adapting recipes, making them all-in-one and then leaving the dough hook attachment to do all the hard work. It’s sometimes difficult to know when the dough has been kneaded sufficiently but Paul Hollywood (of Great British Bake-Off fame) in his recent series on bread, gave out a very useful tip. 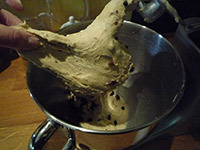 The dough is ready when you can pull it and it’s elastic enough to stretch without pulling apart. This method really works, try it. I add dried fruit, a mixture of what I have in the kitchen – at the moment I have some lovely large dried cranberries which go well with raisins and currants but you could just keep to currants or try adding in some glacé cherries or mixed peel. I also find that some lemon zest adds a nice flavour but this isn’t essential. Normally, I divide the dough in half once it’s risen and make half into ordinary buns, and half into Chelsea Bun style rounds, adding fillings like cinnamon with butter and brown sugar, chocolate chips or mixed chopped nuts. Smarties (or M&M’s) are good fun and give a satisfying crunch. Yesterday, I wanted to use up a pack of marzipan I’d had in the cupboard for a long time (past it’s best before date but who cares?) We are both crazy about marzipan and the idea of hot fruit buns with almond paste melting through the centre had us salivating at the thought. So, to the recipe then, which is an easy all-in-one for a mixer with a dough-hook. If you want to glaze the top of the buns, use 1tbsp of golden syrup, gently heated, then spread over the buns while still hot. Put the flour, salt, butter, sugar, lemon zest if using, yeast and the egg into your mixer bowl. Using the dough hook attachment on the minimum speed, mix the ingredients then very slowly pour in the milk. Once a dough is formed, turn up the speed slightly and knead for 5-10 minutes. You can add the mixed dried fruit half way through and continue mixing. The dough is ready when it doesn’t break when you pull it apart, it should be elastic and soft. The dough is ready when it’s elastic and soft. When you are satisfied that it’s ready, remove the bowl, cover with some cling and leave to rise. It’s ready when it’s doubled in size (it will take several hours in a cold kitchen). Lightly grease a large baking sheet with butter. On a lightly floured worktop, knock back the dough and make a large ball. At this point I divide it into two and make half into buns. Divide the dough into equal size portions, and roll into smooth buns – you should get 8 large buns from half the dough. Place them well apart on the baking sheet, cover with some greased cling film or a clean teatowel and leave to rise. 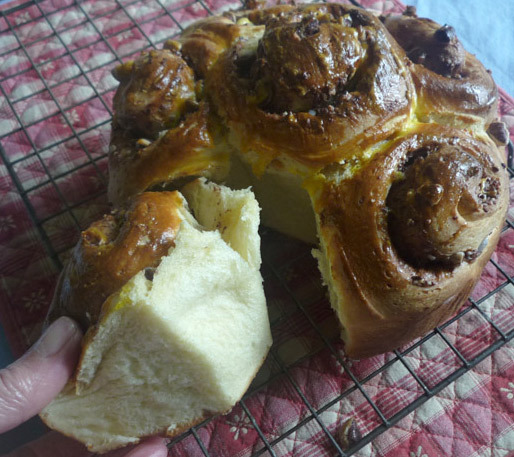 For the Chelsea style buns, grease a baking tin with butter. Roll out the other half of the dough into a large rectangle. Now you can spread on your chosen filling. If you want to try the marzipan filling, line the base of your tin with greaseproof paper. From my experience if you don’t line it, the marzipan will stick to the bottom and make it difficult to get the buns out. 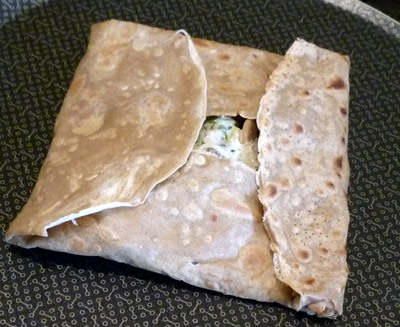 Roll out the paste as thinly as you can and cut it into a rectangle slightly smaller than the dough. 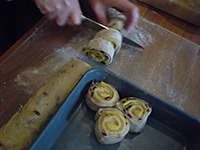 Starting from the long edge, roll the dough tightly like a Swiss Roll with the filling inside. It’s quite robust, you can press quite hard making sure it’s all tightly rolled. 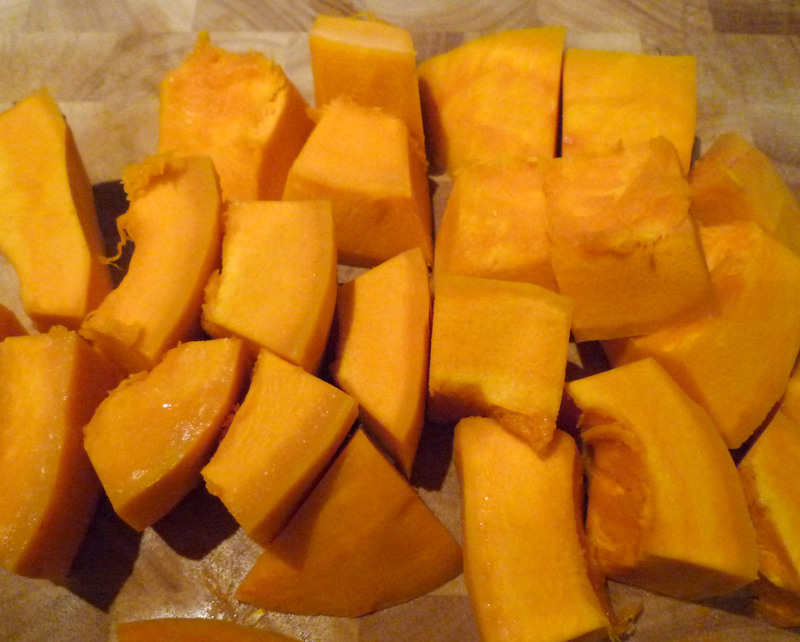 Then using a sharp knife, divide the roll into equal size slices, you should get 8-10 pieces. Place the pieces evenly over the baking tin leaving space between them for the dough to spread and rise. Cover with some cling film and set aside to rise. Once the dough has risen and the slices have doubled in size and joined up in the tin, heat the oven to 220°C. Bake for about 10 minutes – the buns will be done first – take them out as soon as they are evenly browned all over. Glaze the buns while they are still hot then put them on a wire rack to cool. The Chelsea style buns will take a few minutes longer to cook and are done when they are nicely browned and firm to the touch. Don’t be tempted to overcook them because of the filling – they are better served soft and moist. Leave these in the tin to cool slightly before turning out onto a cooling rack and removing the greaseproof paper. They are delicious served warm. Fruit buns with marzipan, fresh out the oven. 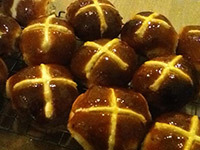 If you want to make the classic Hot Cross Buns, follow the same recipe but add 2tsp mixed spice with the lemon zest. Make a flour and water paste and using a piping bag, make a cross on each bun before you put them in the oven. Glaze with warm golden syrup and leave to cool. I was only turned on to the delights of a ripe pear a few years ago in a late summer market in Sully-sur-Loire. It was the last few weeks of researching a guide to the Loire Valley. We’d just visited the wine region of Sancerre as grape pickers were starting the harvest. Bending double between the vines, snatches of their lively conversation carried toward us on a light autumnal breeze. After exploring the old town and tasting some of the local goat’s cheese, we continued our journey following the Loire downstream and ended up in Sully where we found a small hotel to stay the night. Awoken by what seemed an inordinate amount of traffic for such a sleepy looking town, I opened the shutters the following morning and there was the local market in full swing. The centre of the town was completely packed with stalls and vans, overflowing with the fresh local produce we’d come to expect on our trips to the Loire. Now though, there was the wonderful smell of ripe fruit on the air. Apples – green, red, yellow, streaky, russety and rosy with names that had become very familiar like Reine de Reinette (the classic apple for Tarte Tatin), and others that were a revelation. And then there were pears. Long, short, stout or skinny, dimpled and smooth, green and pink, speckled and shiny, the delicious peary perfume was overwhelming. 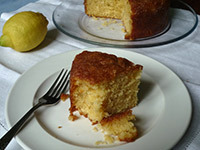 Pears are now a regular part of my dessert repertoire, a recent favourite being Hugh Fearnley-Whitingstall’s Pear and Almond Pudding Cake (River Cottage 2009) which is great for an indulgent pudding among friends. Then the other week, I was watching The Hairy Biker’s Best of British, and there was the pear again. Combined with my favourite, the almond again, but this time with a tempting drizzle of dark chocolate melted into the filling. I couldn’t wait to try it. 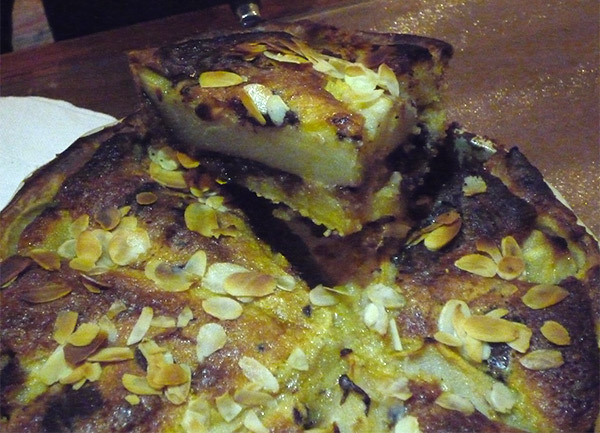 I didn’t follow their recipe but I made a basic frangipane with pears, chocolate and flaked almonds. Heat the oven to around 200ºC. Line an 8″ flan with your pastry but don’t trim the edges yet. Melt the chocolate in a bowl over a saucepan of boiling water on a low heat. You can safely let this happen while you make the filling. In a bowl, beat the margarine and sugar until well combined and add the eggs a little at a time. If the mixture starts to curdle add a little of the ground almond or a spoonful of flour to stop this happening, then continue adding the eggs. Stir in the ground almonds and add a few drops of almond essence if you like a stronger almond flavour. Peel and quarter the pears, removing the centre pips and core. Now you can assemble the tart. Spoon in the almond filling and spread evenly. Arrange the pear quarters in a circle, fat ends to the outer edge. Now drizzle the melted chocolate randomly over the top and finally, sprinkle with the flaked almonds. Trim the edges of the pastry if you like a neat edge or you can roll it over for a puffed, more rustic appearance. Place the flan in the oven for about thirty minutes until it’s golden brown on top and firm to the touch. This flan is best served warm with a dollop of crème fraiche on the side. 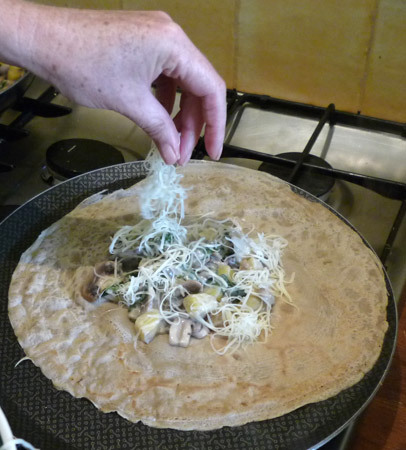 Crêpes (or savoury galettes) are so adaptable – they make a satisfying meal and you can ring the changes on the fillings according to what you have in the fridge or the garden. One of the best restaurant crêpes we’ve had was on a visit to Nantes while we were working on a guide to the Loire Valley for Footprint Books. The Crêperie Heb-Ken (5 rue de Guérande, Nantes) is tucked down a side street but it’s hard to miss with it’s bright facade and jolly pavement tables. Inside it was packed with lunchtime diners, a sure sign that the food is good. The extensive menu took some time to read and then it took even longer to decide what to have but when the food arrived, it was absolutely delicious. After this I was inspired to purchase my own crêpe pan and start experimenting. While they might not be authentic, the crêpes I’ve arrived at are tasty, nutritious and filling – what more could you ask? 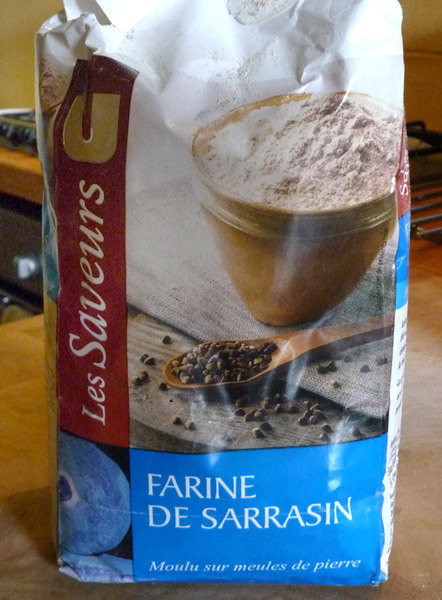 The secret to a good crêpe lies in using buckwheat flour (sarassin or blé noir in France) which isn’t actually flour at all, but the milled seed of a plant that’s related to rhubarb and sorrel. It’s gluten-free, a great source of protein and minerals and contains rutin and Vitamin E which are both powerful antioxidents. 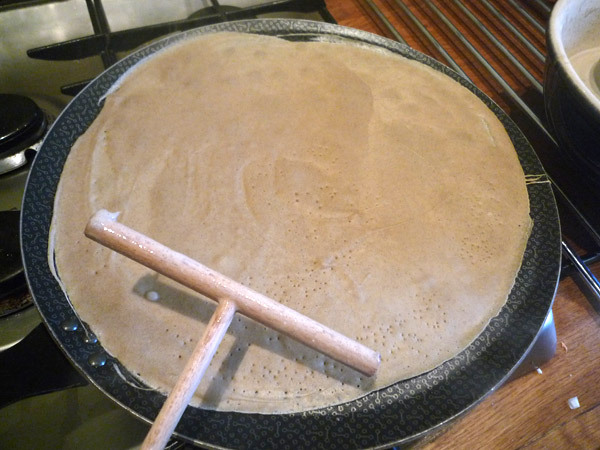 If you use 100% buckwheat, you’ll need to let the crêpe mixture stand for at least 2 hours, but mix it half and half with plain flour and it’s possible to use it more or less straight away although it improves with standing. Crêpe pans are available in supermarkets here in France and cost from around €12 though you can pay a lot more. The best little gadget if you can find it is the spreader – a wooden dowel that spreads the mixture evenly around the pan which is often sold together with the pan or you can find them in kitchen shops for a couple of euros. It’s indispensable! Put the flours in a large bowl and make a well in the centre. Beat the eggs and pour into the centre along with the oil and salt. Use a whisk to combine these and continue, adding a little of the water at a time, until you have removed the lumps and incorporated all the water. Cover and leave to stand while you prepare your fillings. Spread the mixture evenly round the pan with a spreader. When the first side is browned, the crêpe will lift easily to turn it over with a spatula. The simplest filling is grated cheese. I use a gruyère such as Comte which has a nice nutty flavour and combines well with the flavour of the crêpe. Other cheese such as a strong cheddar would be best combined with other ingredients such as mushrooms or cooked fresh tomatoes (see below). Simply slice mushrooms and fry gently in butter. Season well with salt and pepper. Best combined with cheese and/or ham in a crêpe but if you have plenty, they’re good on their own with a spoonful of crème fraîche. If you have left-over cold potatoes, chop them into cubes into the mushrooms making sure they’re heated through before serving. Cooked spinach leaves seasoned with salt and pepper combine well with mushrooms and créme fraîche. A little Comte cheese sprinkled on top gives it a sharper flavour. We thought this wouldn’t work but we tried it at Crêperie Heb-Ken and the flavours are amazing. Using fresh tomatoes, skin and chop them (removing seeds if you prefer) and add to some hot olive oil with a crushed clove of garlic in a shallow pan. Cook them until the flesh breaks down and the liquid is reduced. Season well with salt and pepper and serve in a crêpe with cheese or ham. When the filling is hot and the cheese starts to melt, the crêpe is ready to serve. During the course of our work we have visited and photographed many, many properties. Some have been private homes with exquisite interiors that we have had the pleasure to visit and talk about in magazine articles. Most are places we have stayed or holiday accommodation that we are reviewing either for our own website or on behalf of others. 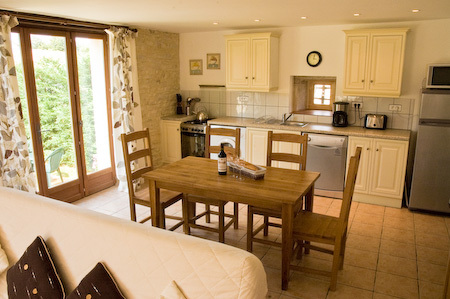 Whether it be a chambre d’hôtes or self-catering accommodation, we are often invited to style and photograph the properties for magazine features, advertisements, websites and brochures. Whatever the purpose you intend for your photographs, you should make sure the results reflect the properties at their best. Below are some guidance notes drawn from our experience to help make your property stand out from the rest. Plan your photo shoot carefully. Decide what pictures you require for your project(s) making a note of when the views will be at their best. Make a note of the times when the interiors get the most sunlight, and when the exterior looks best. This is the time to take your pictures. It may take more than one session to complete your shoot. Interiors can be shot on an overcast day whereas only blue sky and sunshine is acceptable for exterior views. Clean and tidy the rooms and put an extra bit of shine on surfaces and chrome fittings. Pay extra attention to bed linen and towels. They must be a matching set and make sure that any cover / counterpane is absolutely spotless. Remove from sight any dishcloths, cleaning products, plastic bin liners, waste bins – in fact anything that detracts from the “perfect” look. A good way to check is to look through the camera lens and the eye will be drawn to items that look out of place. Also look out for imperfections such as curtains that are not hanging correctly, cushions at the wrong angle, crooked pictures and so on. Rooms often look a bit bare when unoccupied by guests. Make them look more homely with a few styling props. Keep looking through the camera lens and don’t be afraid to move tables etc. to close up spaces and create a better picture though guard against making a room look smaller. Living area – place one or two matching cushions on the chairs or use a cosy throw combined with an up-market magazine and a tray of tea to give a relaxing mood. See how switching a table lamp on changes the mood and fresh flowers in an attractive vase can be moved around the property to enhance an empty window sill or side table. If there are French doors opening on to the garden – try opening them and see what effect it creates. Are there any interesting features, if so, take detail shots for your portfolio. Kitchen – it’s important to show all the best features, and include the dining table if at all possible. If you offer a welcome basket, have one ready to display and make it look really special. A bottle of wine and some glasses often works well and conveys the French holiday feel. A large dining table can be improved by adding a colourful table runner and some place settings. Always keep your options open on future uses by taking pictures with and without added props. Bedroom – Lighting is very important in the bedroom as people like light and airy rooms but also want to feel cosy. Therefore, always take shots with and without artificial lighting. 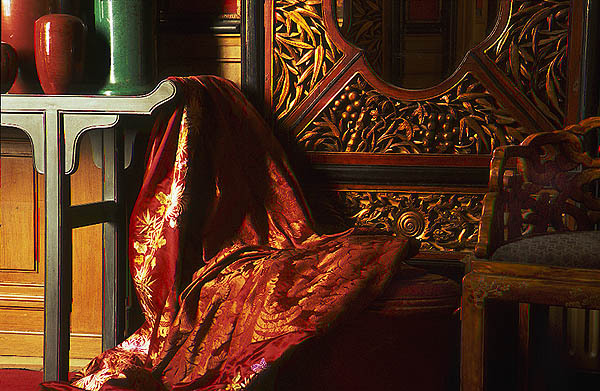 Detail shots are successful if you have particularly nice bed linen. It creates a luxury feel when combined with a simple flower arrangement on the bedside table. 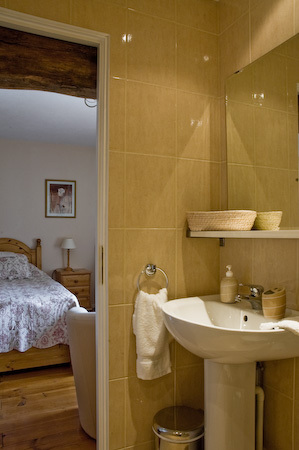 Bathroom – Probably one of the trickiest rooms to take effective pictures, not least because it is usually quite compact and the photographer can find him/herself in some very odd positions. Look through the lens and check that all the surfaces look especially clean. Include a set of towels if it enhances the look. Having some luxury bathroom items in your props bag helps. Try a bottle of French liquid soap or a block of huile d’olive savon combined with a fluffy white hand towel for a detail shot. Place yourself in an elevated position to make the most of a formal setting. 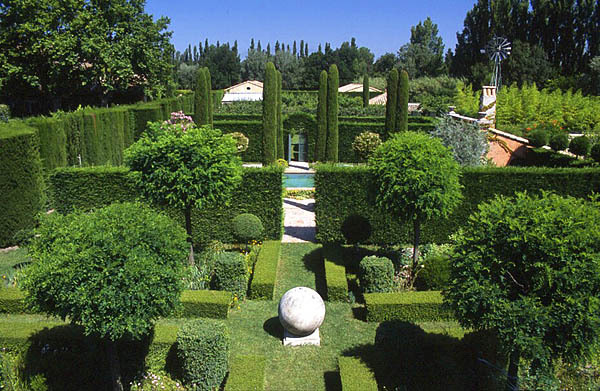 Private garden in Provence, France. Garden – whatever time of year you take the pictures, the garden has to look exceptional. Spend an afternoon cutting the grass, tidying the borders, raking the gravel – whatever it takes to make it look its best. A spray with a hosepipe just before you take your pictures will give a sparkle to a flower border. If it lacks colour, go to the Garden Centre and buy pots of flowering plants and place them in the borders. Remove any plastic play items (unless being used to illustrate a play area), but do include seating with a table and a parasol. Place a tray with glasses and drinks or coffee pot and cups, plus an arrangement of flowers from the garden if this improves the picture. A colourful table runner looks good on a rectangular wooden table and plastic tables can be improved with a colourful plastic cloth though avoid anything too striking. If you are taking an exterior view of the property, make sure any plants are in good condition, and again, add one or two pots for form (Box balls or small standard Bay or olive trees), or colour (pelargoniums, lavender). Swimming pool – it goes without saying that any imperfection in the pool or the surrounding area will show on a photograph so do everything you can to present a tidy, clean and safe environment around your pool. Sun loungers should be in perfect condition and placed in line or in groups determined by the space. Include any desirable features such as a shower, shady seating, changing area etc. When taking general shots of people, for example children playing in the garden, a group enjoying a meal al fresco, or even a scene from a local visitor attraction, it is not usually practical to get written permission from everyone appearing in your photos. In cases like this, don’t take close-ups, and avoid full face exposures. It is always advisable to get the model to pose so tell them what you want them to do to get your picture. Think carefully about what they are wearing and how they look. If they feel awkward, give them a prop to use – carrying something, using something, or stroking a pet will help them to relax. 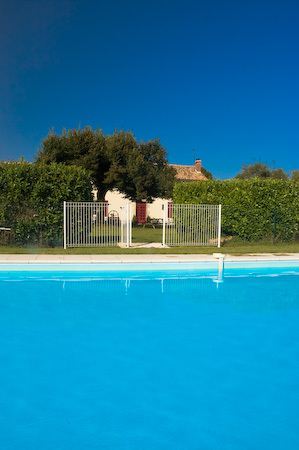 Based in Poitou-Charentes, Western France, Roger Moss is an experienced photographer creating stylish images of holiday accommodation and period homes for all applications. Contact him on roger.moss@rogermoss.com to see sample images and quotations. 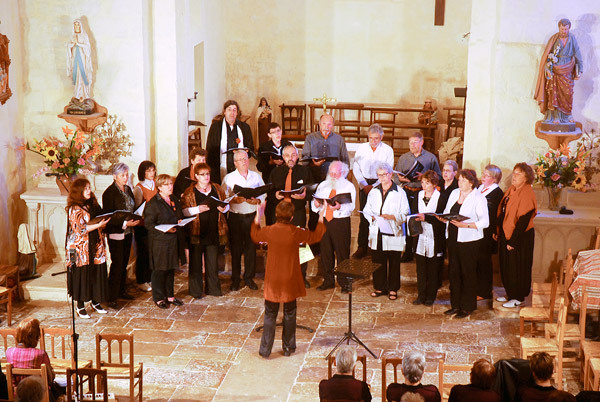 Every Wednesday evening I drive about 15 minutes from home and spend an enjoyable hour or so singing with a French choir. Being in an area popular with British ex-pats, about a quarter of us are English but essentially, French is the language we use. As people arrive, one greets and is greeted by everyone either with a cheery “Bonjour. Ça va?” or a friendly “Salut!” and one or two bises (a light kiss on the cheek). This takes some time with an average of 25 or so people turning up to sing each week but it does make you feel part of the team and new arrivals are no exception. An English visitor sat next to me earlier this year and commented on how friendly everyone was. “Of course”, I replied, “it’s a community choir so everyone knows each other very well, they care about each other…. and we socialise a lot.” Apart from weekly practices, we give concerts around the region and venture further afield to other regions of France and even to the UK. 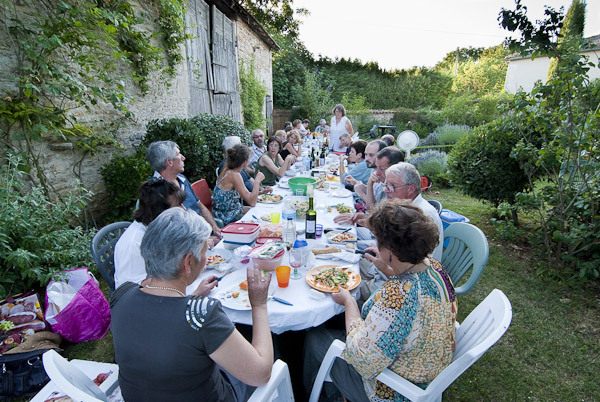 Food and drink always play their part, whether it’s a picnic, a summer party, or a fundraiser, there’s a generosity and natural sense of fun and sharing surrounding food that makes it such an important part of our choir community. After every practice we gather together to have a drink and something to eat before leaving for home. Taking it in turns to bring the food and drink ensures that there’s something different every week. Some bring mainly sweet things – cakes (chocolate being the favourite), fruit tarts, biscuits, and so on. Others have a more savoury inclination and will bring home-made paté, cheeses, olives, quiche, pizza – all manner of things. One of our sopranos runs a business with her husband called ‘Fromacoeur‘ They manufacture tasty little Goat’s cheese bites which are sold across Europe, even in Marks & Spencers where you’ll find their delicious little stuffed peppers in the delicatessen range. Others might bring huge turines of paté maison (home-made paté), or the regional speciality known as chou farci (stuffed cabbage). When the choir performs, one or two people always take it upon themselves to bring a large flask of coffee and some biscuits – always very gratefully received, especially when we’re singing in a cold, damp church. One of the tenor voices runs a drinks supply business and started a little tradition of bringing a bottle of pear liqueur to concerts. So if you attend one of our performances and wonder why we’re late arriving on stage – you know why! With an Autumnal chill in the air at night and shorter days, the veggie garden is beginning to shut down. Somewhat annoying are the peppers and aubergines which are covered in flowers – I doubt that we’ll ever see the fruit grow but it’s a valiant last effort on their part. 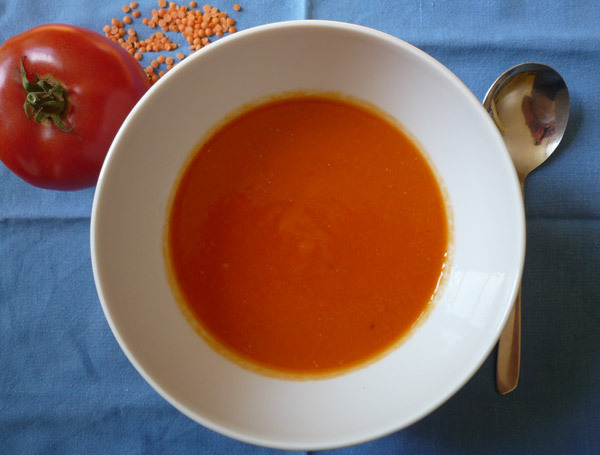 So, soup is back on the lunchtime menu and here’s a lovely rich combination of taste and colour. In a large saucepan, heat the olive oil then gently fry the vegetables and garlic for about 5 minutes until softened taking care not to let them brown. Meanwhile, skin and chop the tomatoes and add them to the pan. 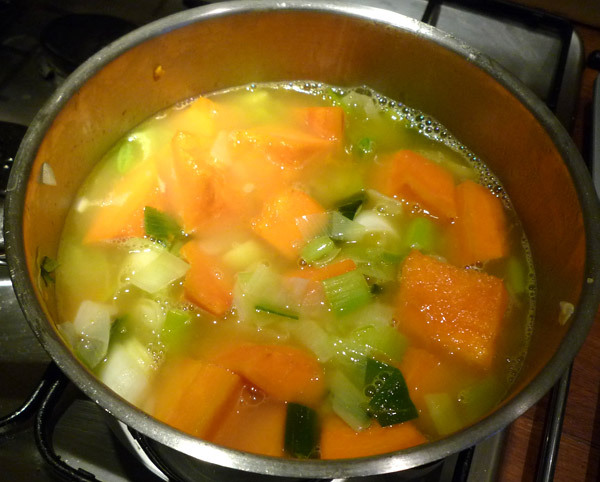 Rince the lentils and stir them into the vegetables with a stock cube and some water. The quantity of water required will vary according to how juicy the tomatoes are. 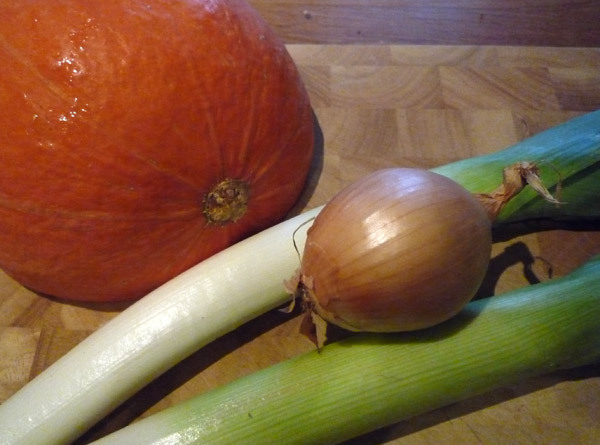 Bring the soup to the boil then simmer on a low heat for about 20-25 minutes, stirring occasionally. It’s ready when the carrots are soft. 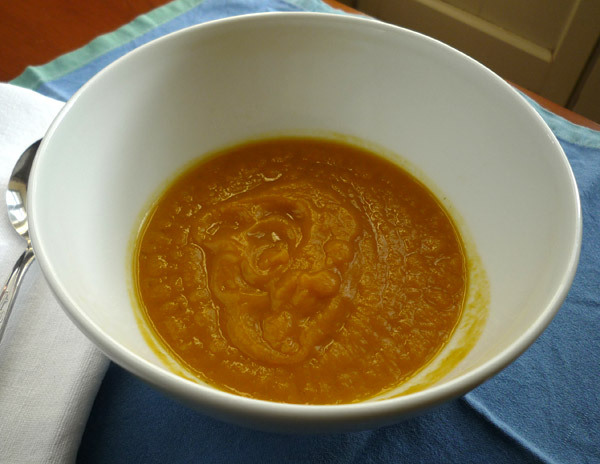 Leave to stand for a few minutes then whizz the mixture to a smooth soup with a blender. Add salt and pepper to taste and serve with fresh bread and some grated Comté, Cheddar or parmesan cheese sprinkled on top.